This page has been set up to assist users within the Reports & Applications area of CAR's website. Below you will find information regarding questions often asked and useful information for accessing and using this area. Please note that this page has been left as a single long page so that it can be easily printed for reference. Use the side navigation to quickly access areas of interest. If you have specific questions relative to the data contained in a report, please contact the appropriate department at CAR directly. A key or terminal next to a report title indicates the report is secure and requires a user-id and password for access. If you have trouble accessing a secure report, contact your security administrator who, in turn, will contact CAR data operations for problem resolution. You have access to only those reports that your security administrator designated. After 30 minutes of inactivity you will be disconnected from the system. If you wish to enter the system again, you will need to sign on again. Additional information on Secure Reports is available on the Request Access Page. A key or terminal next to a report title indicates these secure reports may require the Report Viewer or Reflections for the Web which requires a java applets. If you have trouble starting a Telecommunications session you may need to install the Microsoft Java Virtual Machine or the Sun Java Runtime Environment. Many users as they have upgraded their desktop systems have noticed they are unable to start Telecommunications. This is due to the absence of the Java Virtual Machine in recent versions of Microsoft's operating systems. Please contact your System Administrator and have the Microsoft Java Virtual Machine or Sun's Java installed on your desktop system. Users may need to have their system administrators make the following DNS entries into their firewall for access to CAR's FTP and Telnet resources. Please remove any previous issued IP addresses used to access CAR's FTP or Telnet. Additionally, port 992 must be open on your firewall for secure Telnet access. Passwords for both the Telecommunications System and secure website applications automatically expire after 60 days. Initial passwords expire the first time used. To reset an expired password, enter a unique password (one not previously used). If you forget your password, contact your company's security administrator who will contact CAR. Three failed attempts to access a secure report on the website or the Telecommunications System will disable your user id. The password rules and restrictions for each system are listed below. The password must be made up of at least 6 alphanumeric characters. No embedded blanks are allowed in a password. CAR keeps a history of the most recent password associated with a user ID. The password must be made up of from 6-8 alphanumeric characters. The only 3 special characters allowed in a password are @, #, or $. No embedded blanks are allowed in a password. No more than 2 pairs of repeating characters are allowed. For example, SUMMMM would be a valid password but SUMMMMM would not be valid because the M is repeated 5 times. CAR keeps a history of the last 6 passwords associated with a user ID. This means that you cannot repeat a password until you have used five other unique passwords. A key next to a report title indicates the report is a secure report and requires a valid user-id. Do not block cookies, as the security system needs to set one in order for you to move about the website. 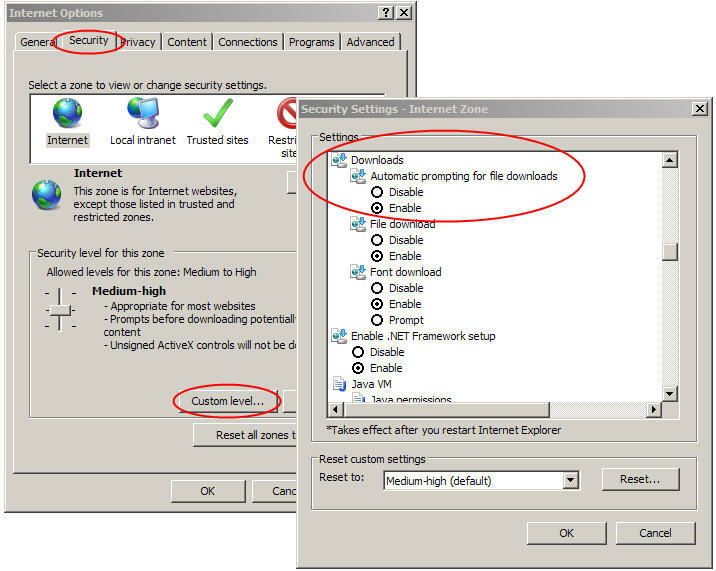 Options for cookies can be found under Tools - Internet Options - privacy tab in Internet Explorer or Edit - Preferences - Privacy & Security in Netscape. Some of the secure reports require pop-up windows. If your browser has pop-up windows blocked, please add www.commauto.com to list of allowed sites. A terminal next to a report title indicates the report resides on CAR’s Telecommunications System. Selecting a Telecommunications report will bring you to the Telecommunications Page. To begin a Telecommunications Session select Start Secure Session for a secure Telenet session. This will automatically generate a Telenet session connection to the Telecommunications System via Reflections for the Web (a java applet). In order for this connection to be valid, port 992 for secure Telnet must be open on your firewall. Telecommunications reports are secure and require a user-id and password for access. Additional information is available on the Telecommunications page. A spreadsheet next to a report title indicates the report is available in Microsoft Excel format. CAR distributes reports in Microsoft Excel format to allow easier manipulation of data. From Internet Explorer's Tools menu select Internet Options. On the Security tab select Custom level... for the Internet zone. Scroll down to the Downloads section and select Enable under Automatic prompting for file downloads. Close Internet Explorer and try to download the report. A PDF icon next to a report title indicates the report is available in Adobe Portable Document Format. CAR distributes reports in Adobe PDF for easy downloading and printing. Please note that some PDF files may take a few moments to open or download. Print - use the print command to print a hard copy of your report to the currently selected printer. If the page orientation for the report is different than that of the printer, you must check the printer properties and change it on the print dialog box. Save - save a local version of the pdf file. Navigate - use the up arrow to go back, and the down arrow to view the next page. You can navigate directly to a page by entering the page number in the box and pressing ENTER. The number after the slash is the total number of pages in the PDF report. Zoom - increase the zoom by pressing the + or decrease the page size by selecting -. The page size as a percentage can also be entered in the box. Page fit - additional options for page size. The page can be fit by width or fit the entire page in the viewer. Find - search the report for a text string by entering the string in the box and pressing ENTER.